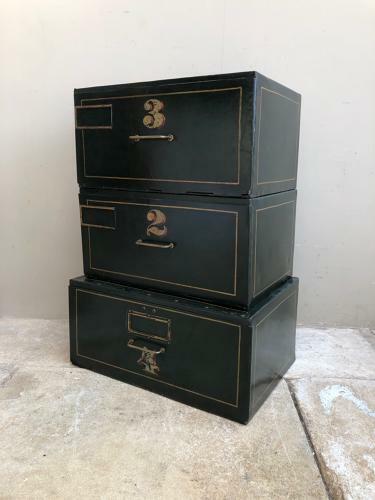 Really wonderful set of Three Edwardian Toleware Storage Stacking Boxes or Filing Cabinets. All with their original paint. Number 4 is the largest with measurements here on the listing. No 2&3 are the same and slightly smaller being same 20cm high but 39.5cm wide and 27.5cm deep. The fronts pull down to open by the brass handles.